Growing up a Novocastrian it’s a treat to get back there at any time, but on a warm & sunny Sunday afternoon for a lazy lunch with friends and family; you can’t get better! It feels like I’m on a seaside holiday! We’re at Sandbar Cafe, a casual restaurant that’s located next to the iconic Noah’s Hotel. It has the most fantastic view out over Newcastle beach. A friendly face in chef’s whites greets us as we arrive. 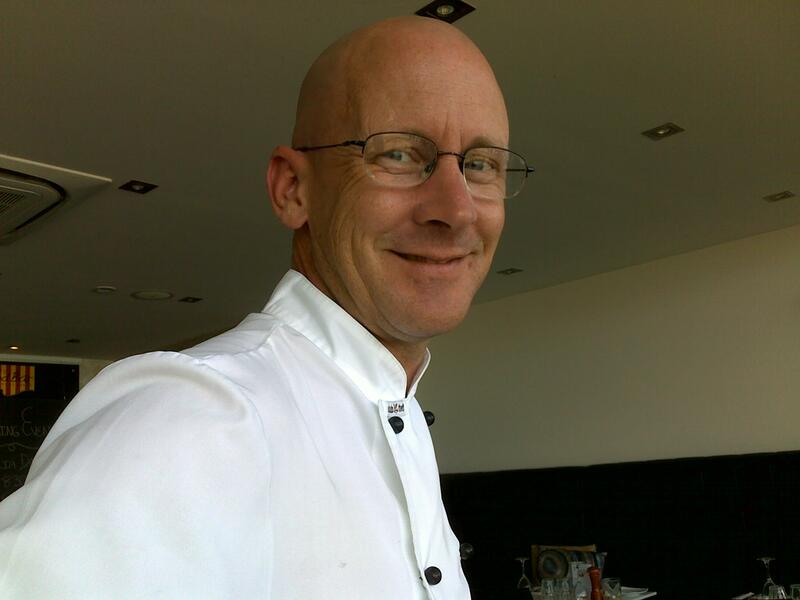 We soon discover that he is Rowan Williams, the head chef with an irreverent sense of humor and a great knowledge of wines having previously worked for Mt Pleasant in the Hunter Valley. Did you know that Aussies generally drink their wines either too hot or too cold? According to the experts, whites should be served at 8°C and reds at 14°C. 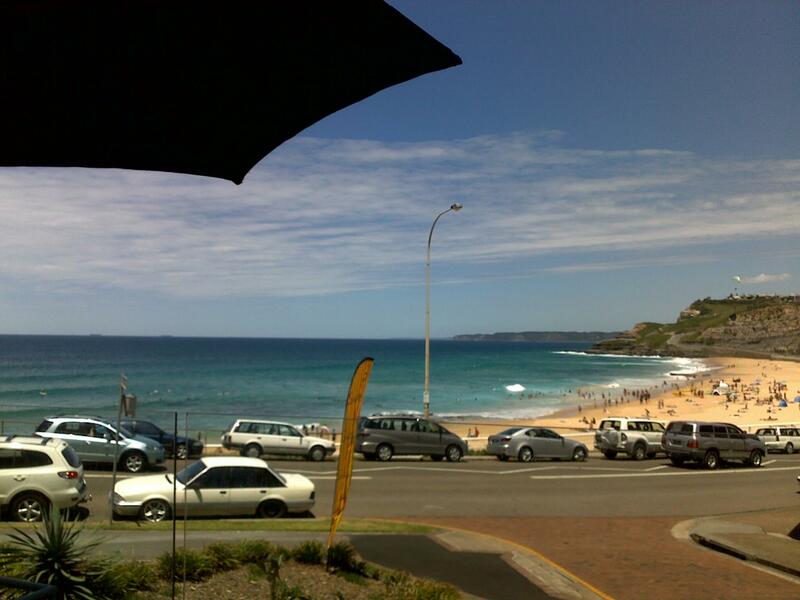 The view from our table is divine and even though we’re technically seated inside, the large concertina doors bring the view right to our table…surfers are out on their boards, people are sun-baking and kids are hot-stepping along the concrete with ice-cream running down their arms. It’s hot. So we order a nice chilled white David Traeger Verdelho $39.50 (bottle) to start us off! The menu is perfectly Aussie summer. 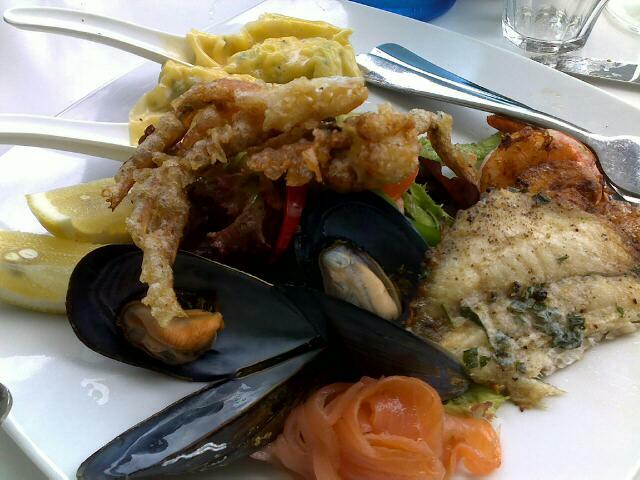 It’s heavy on seafood with an Italian influence but there are a few dishes for those crazy non-seafood lovers! The heat has affected our appetite so the four of us decide to share plates and graze the afternoon away (like all good Sunday lunches!). 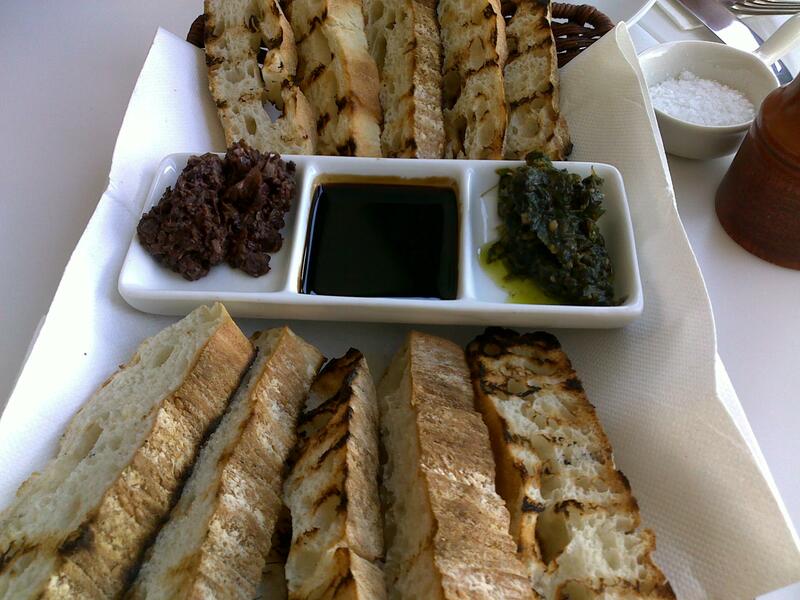 We start with some Turkish bread; grilled and served with a trio of house made dips. The three dips consist of a rocket pesto which is slightly bitter and earthy; a kalamata olive pesto which is chunky and salty; and a thick, gooey, sweet balsamic reduction. I must say I’m not a fan of the rocket pesto but I really loved the balsamic reduction. Our only complaint, as we dig in, is that there wasn’t anywhere near enough dip for all the bread! Rowan our friendly chef is pulling double duty as waiter and he humbly tells us that they’re out of the Salt n Pepper Calamari and the Pork Belly. Such tragedy! 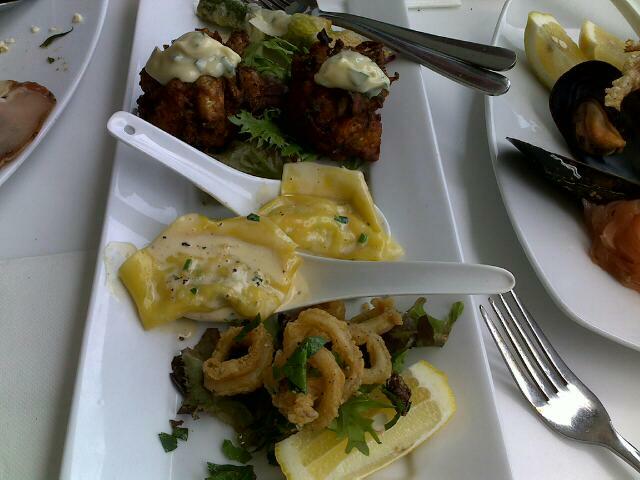 However, there is a small amount of calamari to put on our order of the Tasting Plate, which arrives with prawn ravioli, prawn & whitebait fritter and salt n pepper calamari. It’s supposed to come with the pork belly but as advised there is none and the calamari is quite sparse. If half the dish is missing or inadequate it should be removed or substituted and I’m highly disappointed. We order the Seafood Plate. It comes with a couple of prawn ravioli, steamed black mussels, grilled prawns in their shells, soft-shell crab, smoked salmon and a small fillet of white fish. The prawn ravioli is perfectly cooked; the pasta is light and clings to the filling which is slightly creamy and has a hint of herb. The rest of the plate is OK, but at $31 I’m sure there is something missing. What we do get is simple and tasty. One of my favourite dishes in Modern Australian-Italian food is the stuffed zucchini flowers, so I have high hopes. 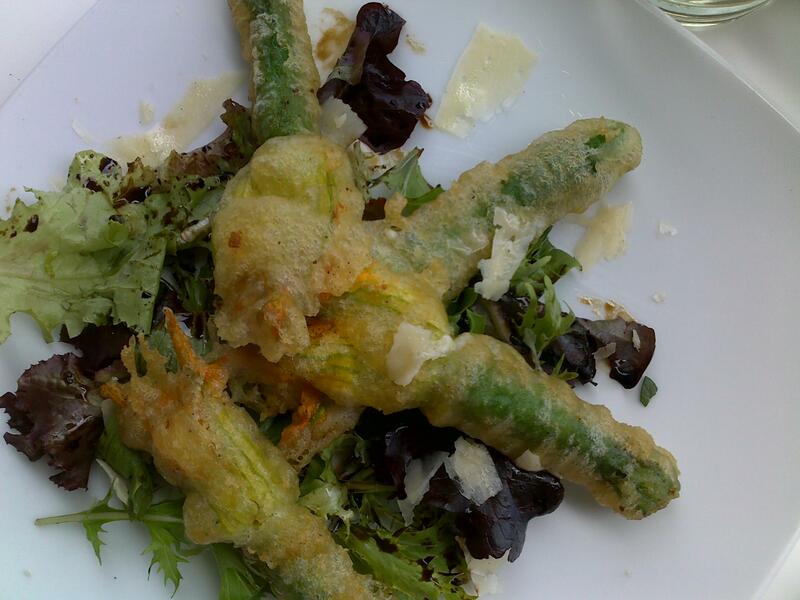 The Zucchini flowers with Italian Cheeses arrive and the produce is small but they look delicious. The flowers are cooked perfectly with the stem being slightly firm. The ricotta based filling is light and moist but it needs a little more seasoning and flavour for my taste. I think they’ve used a tempura batter which is slightly overpowering and on the oily side. For me, zucchini flowers are zucchini flowers and I love them. We finish a second bottle of the David Traeger Verdelho. My heart was set on the Creme Brulee (it’s my aim in life to eat creme brulee whenever it’s on the menu and compare it back to the 7 I had in Paris!) but alas, it was not to be as the kitchen was out….We settled for some coffees and the Lemon Curd Tart $12 and the Chocolate Pudding $12 to share. Not being a fan of chocolate I can only report on the sighs of contentment and the empty dessert plate…but the Lemon Tart was as it should be; zesty, citrusy goodness with a nice consistency and a fantastic after taste. The base may have been a little thick but who’s complaining?! It was a really fine flavour to end the meal. 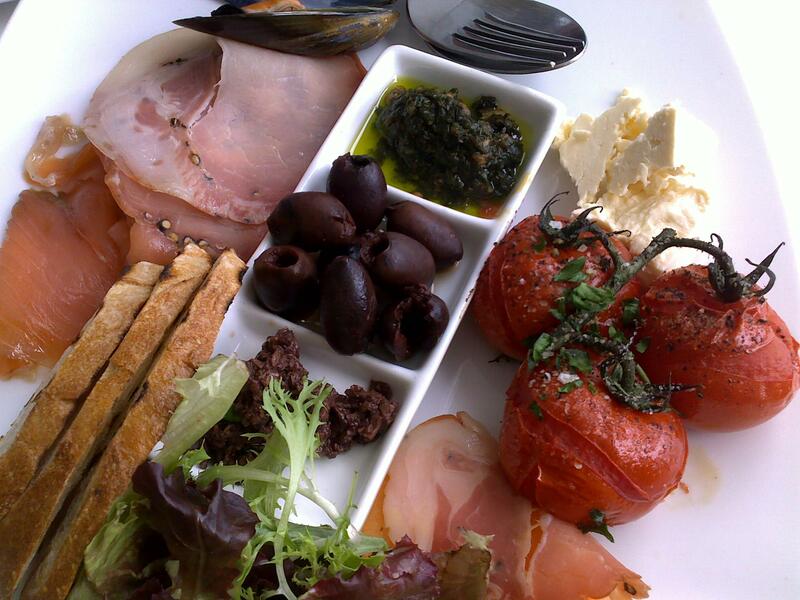 Food: Australian-Italian cuisine, fresh seafood, some vegetarian & meat options. Let down by limited menu availability on the day. Amenities: wheelchair friendly, kid friendly, clean bathrooms, all standard credit cards, no Sunday surcharge, street parking. Sounds lovely! Can’t think of anything better in summer than a view of the beach + seafood heavy menu. I think I’ll go next time I’m up there with Mum and Dad.